My name is John Varty, I am co-owner of Londolozi Game Reserve in the Sabi Sand Reserve alongside Kruger National Park. I am founder of Tiger Canyons in the Free State of South Africa. I am fourth generation South African and have spent a lifetime in the conservation business. In the 70's I was involved in the anti poaching movement in Kenya attempting to protect their rhino. The effort ultimately failed, because the then president Jomo Kenyatta failed to put the Kenyan army behind the National Parks and private organizations trying to fight the poaching. Lessons weren't learnt and in the 80's, Zambia lost all its rhino when President Kenneth Kaunda and Chiluba again failed to support the men on the ground with the national army. South Africa is now making the same mistake. History has taught us nothing! The rhino war is shifting into the private game reserves alongside the Kruger National Park. We are in the tourist business not the anti poaching business. We do not have the finance or expertise to fight this war. Our lodges are internationally known and we are huge employers of people, even more than the mines. My question is why is the South African Defense Force not deployed to help us? Why are senior members of the Defense Force not strategizing with us daily? I believe that in the controversial multi billion rand arms deal, you have helicopters sitting on the ground. We are in desperate need of air support. My information is that you have forces fighting in the Central African Republic while daily Mozambicans raid into our game reserves, killing our rhino. With due respect, President Ian Khama of Botswana, is setting an example. His entire army is aiding the conservationists and he has a "shoot to kill" policy. Ian Khama is communicating with Botswana citizens daily, he is hands on and showing incredible leadership. We need the same! I wrote to President Zuma in September 2011 imploring him to take charge of the rhino crisis. I have heard nothing. I would like to see you as Minister of Defense on television, in the press leading us through this crisis, communicating, strategizing and inspiring us. I implore you to make available troops immediately and treat this as a full scale invasion of our country. When bandits from Tanzania invaded the Masai Mara in Kenya attacking tourists, President Daniel Arap Moi, put the full force of the Kenyan army against them. Within months the problem was solved. We need this approach and we need it now! I would please like a reply to my request urgently. I congratulate you on this powerful letter that you have written. I just hope that it will reach ears who are prepared to wake up , sit up , and take some decisive action. Keep up the great work you are doing to conserve our nature. My wife Fiona , brother Mike and I really enjoyed the day spent with you at Tiger Canyons in September – we truly had a wonderful and enlightening tour. Is there a way you can make a video as well pleading for international aid, especially from America? If I understand correctly, funds from poaching has been used to fund terrorism. If this is true it is an angle to get help from the United States. The Clintons are gearing up for a Hillary run and they have actually spoken about an international effort needed to be taken to curtail this poaching. I think President Obama and Mr. Secretary Kerry would also listen because by bringing up their names you could get attention and perhaps if you can reach out to Anderson Cooper of CNN, you might get attention on the issue, which is certainly a dire need at this point. Publicly ask Al gore for help too. If he is a true conservationist, he'll be forced to answer. 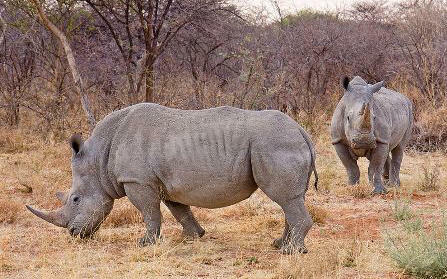 The story reported the arrest of 5 would be rhino poachers, aftattempting to get into the Rietvlei Nature Reserve in Pretoria. I followed this story with interest as Rievlei is literally on my doorstep and I remember how shocked I was when the first rhino was poached there a few years ago, resulting in all the rhinos in the reserve having their horns removed. One of the suspects arrested was already out on bail after being charged with rhino poaching in Potchefstroom earlier this year. This morning it was reported that all 5 have been released on bail. If this is the case, one of the suspects have now been released on bail for the second time and for the same offence. This is an absolute travesty of justice and demonstrates how ineffective our justice system is, and the lack of will of the authorities to clamp down on rhino poaching. Your letter to the deaf minister of defence, minister of environmental affairs and inept president of the country, should be copied onto both the minister and commissioner of police and the minister of justice. However - you will probably get the same response from the former crowd. What to do? Keep up the good work John. We will always remember the day we spent with you and Sunette ( The gate Girl ) The tigers at the canyon and a meal in the evening. What a day. !!! It was Sunday 6/3/2011 At 4pm. Thanks for your time and I wish you all the best in the future. Cheers Sylvia and Geoff Laws. Ps your book was great. I really loved your letter to the Prime Minister in regards to South Africa's Rhino's. I hope you have a positive response to your letter. How is Julie and the rest of the pride? Are there any new cubs this year? I use to write to you about Tiger Canyon when Julie's cub had gotten stepped on the ending up losing her life. Since then I know Ron had passed away, how is Julie doing these days? Well I enjoy your newsletters and photos of Tiger Canyon and other conservation projects. Take care and blessings to all the cats and your family. You are such an example to all of us!! Thank you for being the voice to articulate our frustration too! You clearly have the experience and knowledge to raise these issues with the authorities. Be sure of the fact that there are many who support your efforts to save and preserve our precious heritage. We are forwarding your letter to all our mail list contacts. Right on!!! Keep up the nagging until something is done. Thank you, Mr Varty, for your effort. It is appreciated by ordinary citizens. In May this year, we took our three small children, all under the age of six years old, to Kruger National Park. What a privilege to see so many Rhino's. However, we did make our children aware that these magnificant creatures are under threat. We were accutely aware that with a next visit to Kruger we may not see Rhino's again. We are thankful that individuals like yourself put in an effort to address the problem. It is indeed a source of hope. 150% SUPPORT TO YOU! WELL DONE!! PLEASE, PLEASE LET THEM SEE THE DIRE EMERGENCY TO PROTECTING OUR RHINO!! thank you for this excellent letter. I'll do what i can to move it onto my social media platforms. Thank you for your very informative and well written letter. In short, if the Kruger and our rhino were sprinkled with diamonds and precious minerals, our entire Defence Force and more would be deployed and we would not find our precious wildlife in this situation. Thankfully, Nkandla is well protected in the event of …….not sure what. Appreciate all your hard work and efforts. Good luck with this initiative JV. We are going to need every available soldier to fight off the elephant poaching war that is coming. Were you aware that a global march was organized by the David Sheldrick Wildlife Trust on Friday ….? Hi John ,Good letter ,I have heard the SANDF ,121 Battalion is or is going to be deployed in Tembe Elephant Park to help with the Rhino crisis ,I hope your message is heard ,it seems that things are moving this way . I support this stance by Mr. Varty: where a country’s assets are at stake, that country should be moved to defend it. SA has 80% of the world’s rhino (wild) population, the Game Lodges are renowned and so were the most of our National Parks. Problem, however, is when a country’s leadership shifts its priorities from protecting what belongs to it and trying to be the best it can by contracting the best, to where it must continually fight in-fighting and not promoting the best. Tiger Canyon’s, continue to do your best. I know that you are a key player in the Anti Rhino Poaching Initiative and consequently I thought that you may be interested in the open letter from John Varty, conservationalists. See you at the SUMMIT next week ? Thanks for your initiative and continuing efforts. I hope that your letter gets the response it deserves and does not fall on deaf ears. I am going to forward your email to a friend of mine who I hope can help you. You probably don't remember me but you kindly looked at some paw prints I sent Sunette that you verified as being from a leopard, back in early 2012. Well put ... Really makes one wonder why - Please keep us updated on the reply. Well written John, however I will be greatly surprised if you get a positive response. From a different angel can you imagine what the Chinese government would do if we threatened to kill their pandas to make ladies coats from them! They would go beserk I suspect. I hope you have some effect. Botswana knows it's economy is in large part big game tourism, does SA have the same self image?